The “Type Approval Certificate” also called “TAC” and in some countries called “Homologation Certificate” is a very important document required to register an imported new or used vehicle, Heavy Machinery, Agriculture Machinery and Equipments in most countries of the world. The car cannot import or register withour “TAC” in many countries. In European countries, the Homologation Certificate is called “Euro 4 Certificate”, “Euro 5 Certificate”, or “Euro 6 Certificate”, and is issue to all vehicles that comply with emission standards. The Japan Inspection Organization (JIO) issue Type Approval Certificate, also called certificate of compliance, or certificate of conformance for all used and new Japanese and non-Japanese Automobiles that comply emission test and meet standard set by Japanese Ministry of Land, Infrastructure, Transport and Tourism “MLIT” Government of Japan. located at 2-1-3 Kasumigaseki, Chiyoda, Tokyo 100-0013, Japan, and endorsed by “National Agency for Road Safety and Environment Protection”. 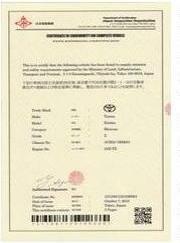 The Type Approval Certificate is the confirmation that automobile meet specified performance standards. Ask the concern authorities in each country/region for the acceptance of TAC by JIO before submit the application. The whole process may take up to 8 working days. In order to get “Type Approval Certificate”, physical inspection of vehicle is required. Bring the vehicle to any nationwide inspection center of this Organization for physical inspection and emission test of vehicle. We can also inspect the vehicle(s) at major sea ports in Japan. An appointment for the inspection date is required in advance. Make payment of inspection fee at least 2 working days in advance before the inspection date. The Type Approval Certificate will be issue after 5 working days of inspection AND receiving scanned copy of Export Certificate (Yushutsu Masho) or Vehicle Registration certificate (Shakensho). In some cases, Type Approval Certificate (TAC Certificate) can be issue for the vehicle (s) that are already exported to overseas countries from Japan. However, in this case, the Certificate will be issue within eight (8) working days. Please contact with full detail of car, such as Make & Model, Chassis number (also called Vin number or Frame number), Engine number, Model year, and so on. Certificate fee: The fee is Japanese Yen 50,000 per certificate (see currency exchange rate). How to pay fee: Payment is accepted by (1)Credit card (2)Bank transfer (wire transfer / telegraphic transfer).